Chicago will elect a new Mayor next week. It probably will be the same Mayor we've had for a long time. In 2008 the country will elect a new President. We know this won't be the same person. It could be a woman, or an African-American or a Mormon. Elections come and go. Millions of dollars get spent. Does it make a difference? The graphic on this page is one I've been trying to get public and private sector leaders to look at for many years. It shows that the school day has three time frames when volunteers can help kids connect with a variety of learning opportunities and experiences. The graphic also shows the timeline every child goes through from birth to a career. James Heckman of the University of Chicago published a paper in 2006 that illustrated the economic good sense of providing age appropriate cognitive and non-cognitive supports to kids from preschool to careers. We spend billions on prisons, according to another study, yet how much do we spend in the non-school hours and on learning supports hat help kids come to school prepared to learn, or leave school prepared for jobs and careers, not jail or welfare? I don't think it really matters who we elect as leaders until we all are spending more time learning what the problems are in our education and youth development systems, and where public and private sector leaders, volunteers and donors can converge as partners in helping schools be more effective in their mission. I've pointed to uses of maps to show where poverty is the prime factor in poorly performing schools and under prepared kids. In the T/MC library I have a section with No Child Left Behind articles. I encourage groups of people to read these and reflect on them, the same way that groups of people read and reflect on scripture each week. What can our elected leaders do? Be the catalyst that points people to this information. Use the volunteer and donate buttons on your web site to point to community organizations where funds are desperately needed to connect kids with volunteers and learning opportunities. Set up a map of your community outside of your office door. 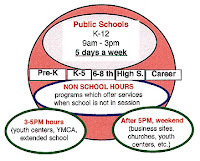 Ask everyone who comes in looking for a favor to put a pin on the map showing where they are doing something to help kids in your community connect with volunteers and structured learning and enrichment opportunities. As the pins on this map show investments in every poverty neighborhood, and every time frame, we'll begin to have the type of support system in every poverty neighborhood that is taken for granted in every other neighborhood. During the past week I've been contacted by two of the students who started with Cabrini Connections between 1994 and 1996, when they were in 7th and 8th grade. One graduated from Syracuse University last spring, and is now starting an acting career in New York City. He told me that he had a small part in a new Barbershop film, which filmed recently in Toronto. He got his start in acting as part of our youth video group. The other graduated from St. Mary's University, near Notre Dame. She's also involved in the film industry, but from a production side. She now lives in London, but works in Chicago when she's not involved in projects. We met at a volunteer recruitment event hosted by Women On Call, a new organization that is helping professional women find ways to volunteer. In the photo above we show a group of our teens and a group of graduate students from Edgewood College in Madison, Wisconsin. This group met in the summer of 2006 at our Chicago location. This was the 7th year that students from Edgewood have hosted a summer workshop with our teens. The goal is to help our teens build skills and aspirations that help them succeed in school and move to college, while also helping the students at Edgewood connect with inner city youth and expand the choices they might make for where they become teachers. If you look at these photos and read stories on the Cabrini Blog, or web site, it begs the question: Just what is a tutor/mentor program? Is it tutoring? Is it mentoring? How do we define it? How do we create metrics that others might use to value it, or invest in it? In the Tutor/Mentor Institute I provide an essay titled Defining Terms: Tutoring. Mentoring. Same words. Different Meanings. In another essay I show the use of maps. My goal is to define what a tutor/mentor program is in terms of what the need for a tutor/mentor program is, based on demographics such as poverty or concentrations of poorly performing schools. As you look at these maps, it's rapidly clear, that one single tutor/mentor program in one neighborhood, serving a growing number of teens and alumni -- a total of 490 since 1993, as of Sept. 2007--is not enough in a city where there are more than 400,000 kids in the school system, more than 200,000 living in high concentrations of poverty, and more than 135,000 attending poorly performing schools. What's needed is leadership that would make such programs available in more places. That's what the Tutor/Mentor Connections seeks to build. But then, how do you defined the metrics, or valuations, of this role of catalyst, information center, net-worker? I just read a book describing the work of the Ashoka organization, titled How to Change the World. Before that I read The Starfish and the Spider. You can find links to both books in the T/MC Links library. These describe work that unfolds over a lifetime, and is only successful because of the passion and persistence of a few individuals with a vision that others don't see. 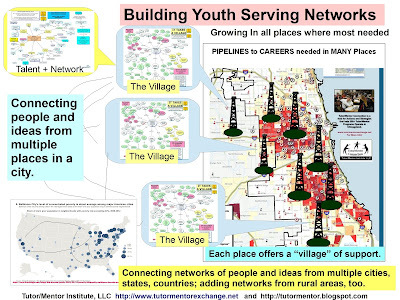 Our vision is helping youth born in neighborhoods of highly concentrated big city poverty get the help they need to be starting jobs and careers by their mid twenties. We hope you'll help us define the metrics, or the values, in way that investors and business leaders will be willing to risk their own involvement. If this moves you, we hope you'll give your support. Andy Carvin is blogging the We Media conference in Miami, and reported comments from a session that focused on "soft power" - how the Internet and online tools have empowered people in ways that weren't possible when traditional forms of power - money, infrastructure, etc - are scarce and concentrated. I encourage you to read Andy's comments. These ideas resonate with me. I believe that the internet gives anyone the opportunity to change the world. That's the Power Of One Debra Berg's radio show talks about. We're not yet to a point where the real potential of this power is unleashed. Too few networks of purpose are yet being created on the Internet. However there are growing examples throughout the world. I've been trying to map concepts and link concept areas to discussions and additional web resources. The Knowledgeworks Education Map of the Future does that better than any I've seen so far. 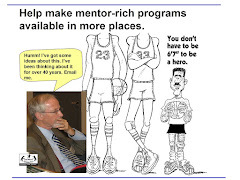 We're trying to create one through the Tutor/Mentor Connection and one way to get involved is to participate in the May and November Conferences or the Forums at the Tutor/Mentor Connection web site. If you're involved with volunteer based tutoring/mentoring or education to career activities, I hope you'll join us in this network of purpose. Today, Wednesday, Feb. 7, 2007 I was the guest of Debra Berg on a VoiceAmerica radio show called The Power of One: What's Your Mission. An archived podcast of this interview can be found at this page.. Just scroll down to the interview with Dan Bassill to listen to the 2/7 interview. Debra is an authority on The New Civic America. She has interviewed dozens of Americans who’ve taken on tough social problems and succeeded! Her book, “The Power of One”, was cited as a work that awakened the nation to a new 21st century trend of civic engagement and heroism. The radio show profiles people who are making a difference through their own efforts, illustrating the power each person has to make this a better world. Volunteers who serve as tutors/mentors, or who help raise the money to support tutor/mentor programs, are demonstrating this power every day.